29 gauge steel signs from Anytime Sign. Most metal buildings have no advertising identification. Millions of dollars of potential POINT OF PURCHASE advertising is wasted for lack of a $8.25 sign. Believe is or not, this decal is the only advertising the builder put on the peak of one of our buildings. 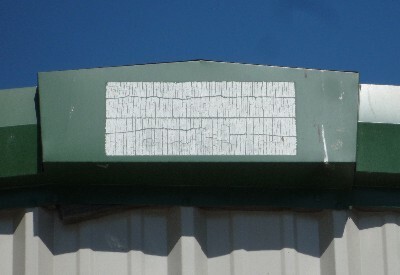 Within a year of the install (1999), the decal began to fade. Soon it was impossible to read. Today, 14 years later, the decal looked like toilet tissue. Our signs are made of 40 year warranted 29 gauge steel. the black of which will not fade in 40 years. Some of the other colors will begin to fade after many years, but will still be legible. Our standard $8.25 sign (when you buy 25 signs) is 15" x 5.75". You get up to 2 colors printed on white for that price. including the background color. 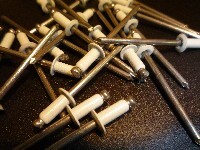 We sell white stainless steel pop rivets.